As I write this, it's almost 10pm on Friday, December 20th. Where did December go? Christmas is just five days away. FIVE DAYS. How's your gift prep going? Got everyone covered? Or did you forget about the neighbors down the street who always leave a tin of cookies or maybe a potted poinsettia on the porch for you on Christmas eve? 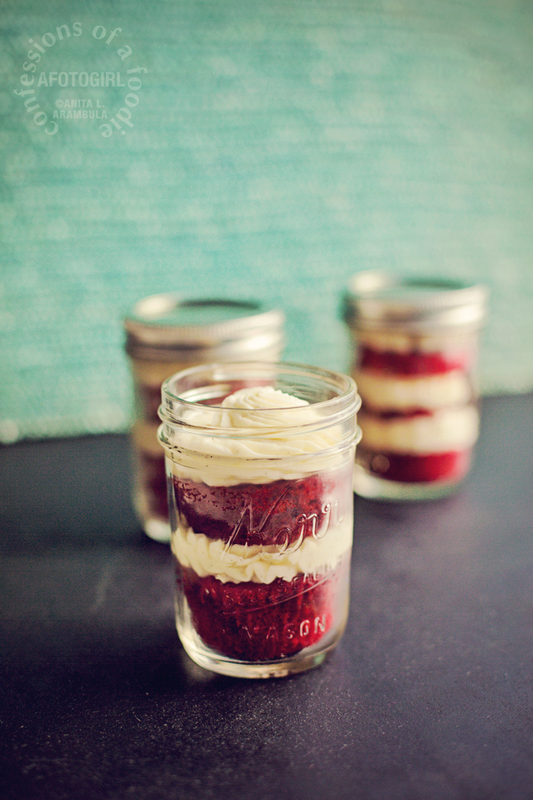 If so, I've got another sweet idea that's great for those last minute gifties: cupcakes presented in jam jars. 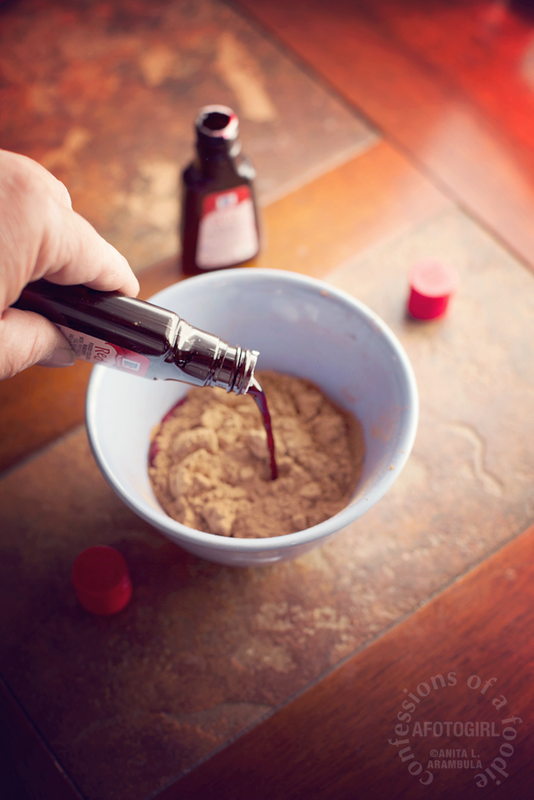 Remember the DIY vanilla extract I made for my Christmas gifties? For my fellow designers at the news mill, I wanted to pair the extract with something baked that highlights vanilla. 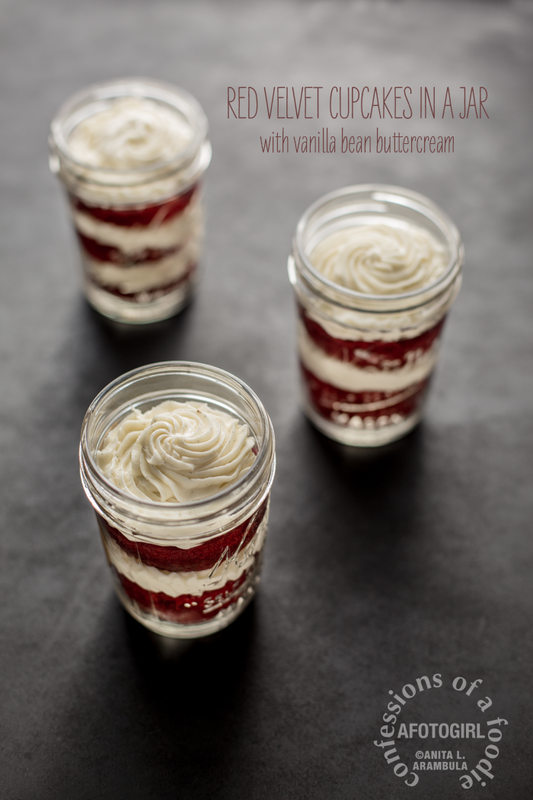 I knew I wanted something that looked festive in the jar so I chose to make red velvet (which has vanilla in the cake) and top it with a vanilla bean buttercream frosting (I have all those leftover beans from the extract making after all). When I was growing up, Mom would make a red velvet layer cake for Christmas. We kids loved the color because it just screamed Christmastime. 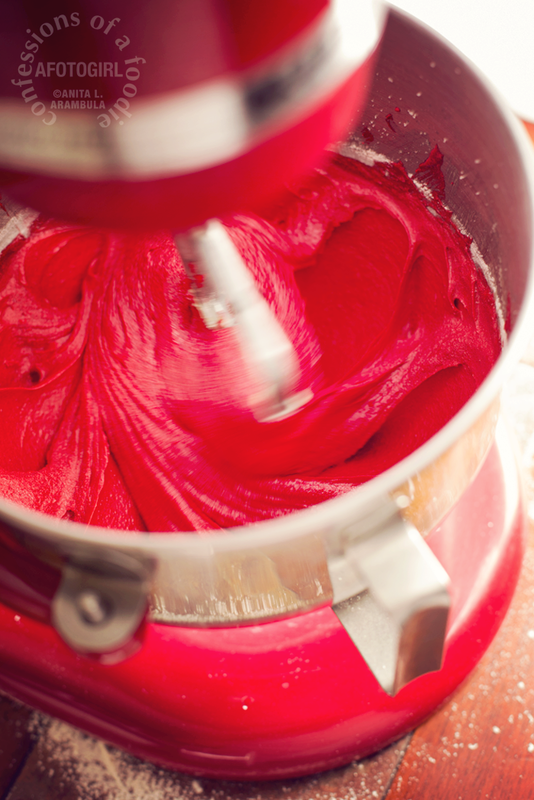 We weren't old enough to know what it is was – we just knew it as mom's red cake. Fast forward to my college years, I'm at a bakery in San Francisco and I see a slice of red cake in the display case and I learn the rest of the world knows this cake as red velvet cake. Of course I bought a slice. It tasted so much like mom's Christmas cake that suddenly I didn't feel like I was 500 miles away from home. I didn't go with the old fashioned frosting version for my cupcakes in a jar because truth be told, I wasn't sure if the frosting could be left out overnight or if it required refrigeration because it contained 1 cup of milk. Anyone in bloggerville know? Anyway, I used a traditional buttercream (that's butter not shortening) frosting and added the caviar from two vanilla bean pods to it. It was a bit on the sweet side so next time, I'm using 3 cups of powdered sugar and not the 4 often recommended. First off, red velvet is not a chocolate cake with red food coloring. 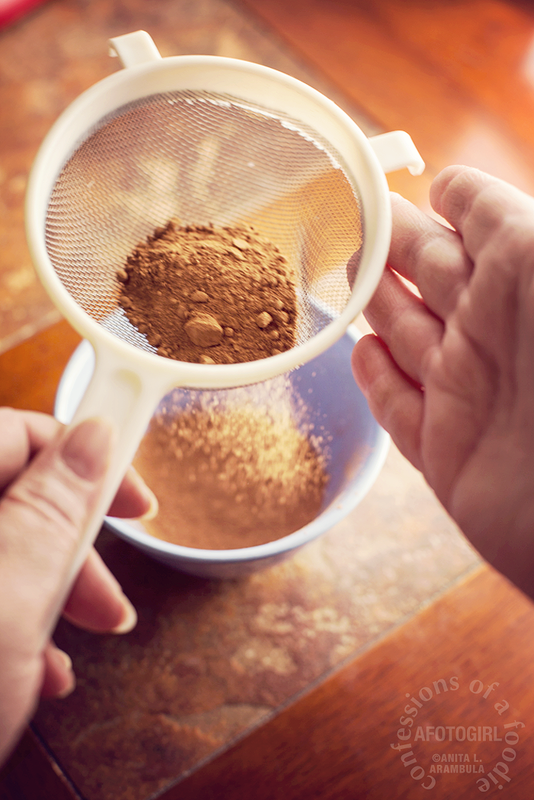 Chocolate cake has anywhere between ⅔ of a cup to 1 cup of cocoa powder. 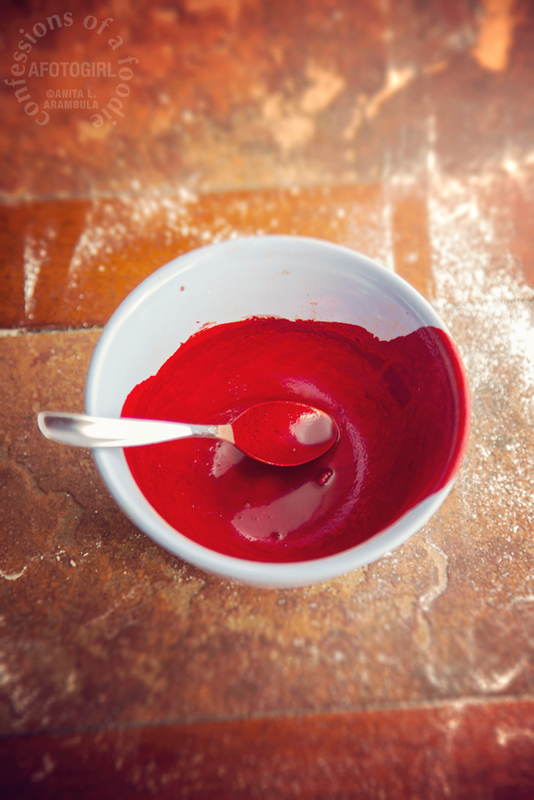 Red velvet has a mere 1 to 3 tablespoons depending on which recipe you follow. As for the cupcake in a jar idea, I found the inspiration for this here while I was on the Speciality Bottle company website a couple of years ago. They have an inspiration gallery and the red velvet caught my eye. I didn't take note of her recipe so it may or may not be the same but red velvets follow the same ratio of ingredients. 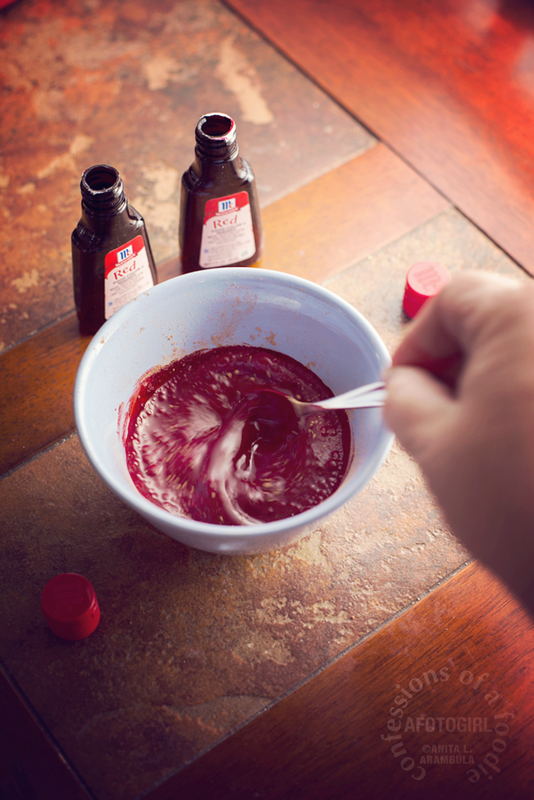 Oh, and if the recipe you are using doesn't include vinegar, it isn't a true red velvet. Just sayin'. Also, two 1 ounce bottles of red food color might sound like a lot but DON'T SKIMP. It's red velvet cake not pink velvet, not mauve cake. Also, for the jars, use wide mouth half pint jelly canning jars. A note on baking IN the jar and sealing it: there are a lot of websites that say it's safe to do. But there are just as many websites that say canning cake products is unsafe. So I don't recommend it personally. Besides which, if you bake it in the jar, you can't layer the frosting and it simply isn't as pretty. And you know me, I'm all about the eye appeal and packaging when it comes to gift giving and food presentation. So bake first, then use the jar for presentation. For the cake: Preheat oven to 350 degrees Fahrenheit. Place the racks in the upper and lower thirds of the oven. If using cupcake liners, prepare muffin tins with cupcake liners. If not, wait to lightly spray pans with nonstick spray until just before adding batter. Make a paste with the food coloring and cocoa in a small bowl. Set aside. 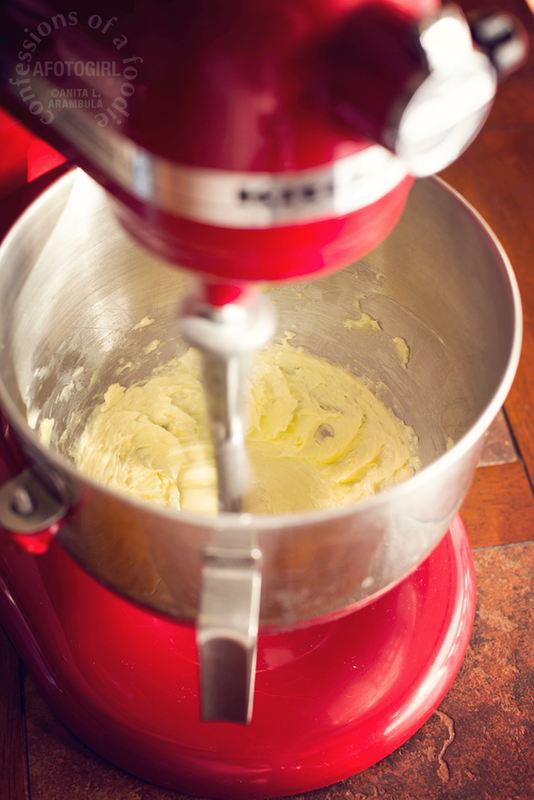 Beat butter on medium speed with an electric beater or using the paddle attachment in a stand mixer until smooth. Add sugar and beat until light and fluffy. Add the eggs one at a time, beating well after each addition. Add the cocoa paste and the vanilla, beat until well incorporated. Set aside. 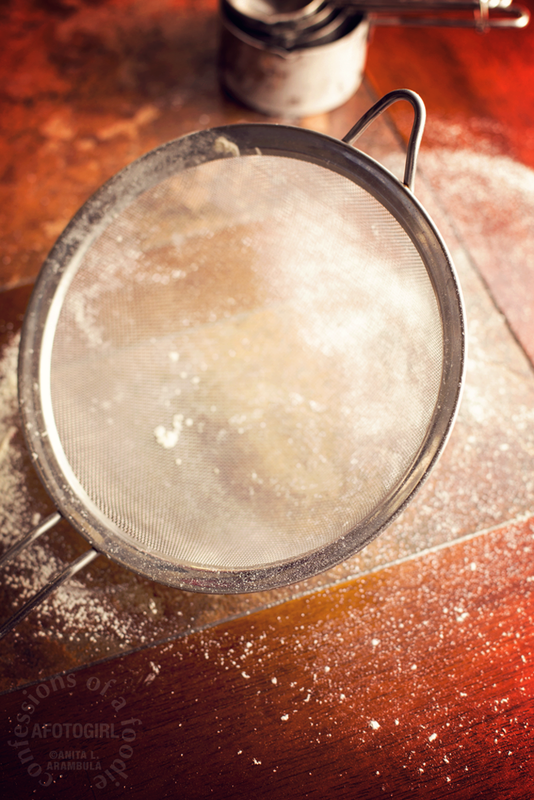 Sift flour and salt together in a large bowl. Add ⅓ of the flour into the sugar mixture. Beat on medium speed until incorporated. Add ½ the buttermilk and beat again. Add the second ⅓ of flour, beat. Add the rest of the buttermilk, beat. Add the last of the flour and beat until well incorporated. In a small glass bowl or cup, add the vinegar. Stir in the baking soda (it will fizz) then quickly pour it over the batter and gently fold it in by hand with a rubber spatula. Bake for 18-22 minutes or until a toothpick inserted comes out clean or with just a few red crumbs stuck to it. Remove from oven and allow to sit in pan for five minutes. If not using liners, run an offset spatula or butter knife along the edge between the cake and pan to loosen. Gently lift the cupcakes out and allow to cool completely on a wire rack. 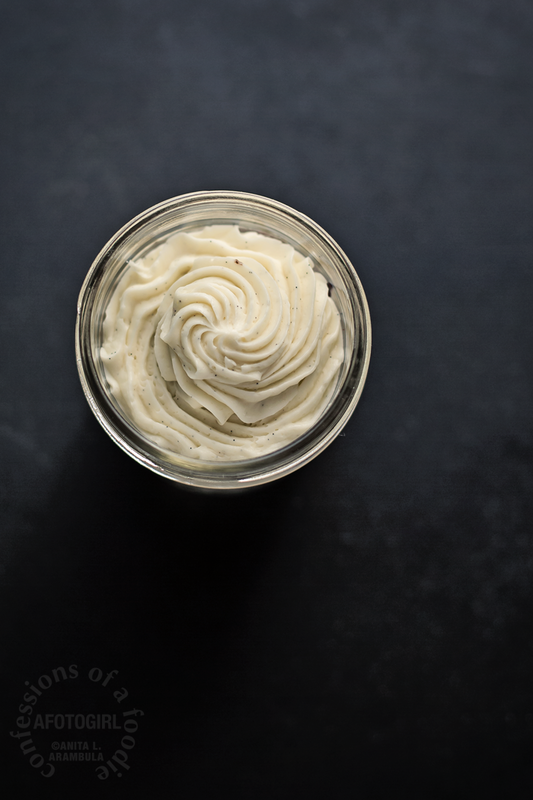 For the frosting: Beat the butter on medium speed until light and smooth. Using a sharp knife, split the vanilla bean down the center and delicately scrape out all the seeds. Add to the sugar mixture. Repeat for the second bean pod. Add the vanilla extract. Beat until incorporated. Sift the powdered sugar in a large bowl to get rid of lumps. Add half of the sugar to the butter and beat to incorporate. Add the second half and beat until light and fluffy. Add 1 tablespoon of the cream. Depending on how thin or thick you want the frosting, add more cream for a thinner consistency. Since I was piping, I went for just 2 tablespoons. Set frosting aside. To assemble: prepare a piping bag with the tip and coupler. Place the bag in a large tumbler or glass and fold over the top of the bag onto the glass. This makes it easier to fill the piping bag with frosting. Add two heaping spatulas worth of frosting into the bag. Set aside. If you used cupcake liners, remove liners from cupcakes. Place one cupcake in bottom of a clean, dry jar. 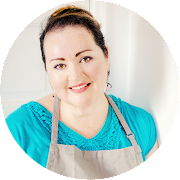 Using your dominant hand, twist the top of the piping bag to gently push the frosting towards the center of the bag, down towards the tip then pipe a layer of frosting over the cupcake. Add another cupcake, pushing down into the frosting. Top with a pretty swirled layer of frosting. If the second cupcake is too large to allow for a second layer of frosting, slice the cupcake in half and only add half the cupcake to the jar. Gently press it down then frost as pretty as you can. Repeat for remaining jars/cupcakes. Screw all the caps tightly onto the jars. Add labels and tie the spoons onto the jar with ribbon, raffia or bakers twine. Your pretty cupcakes in a jar are now ready for gift giving. 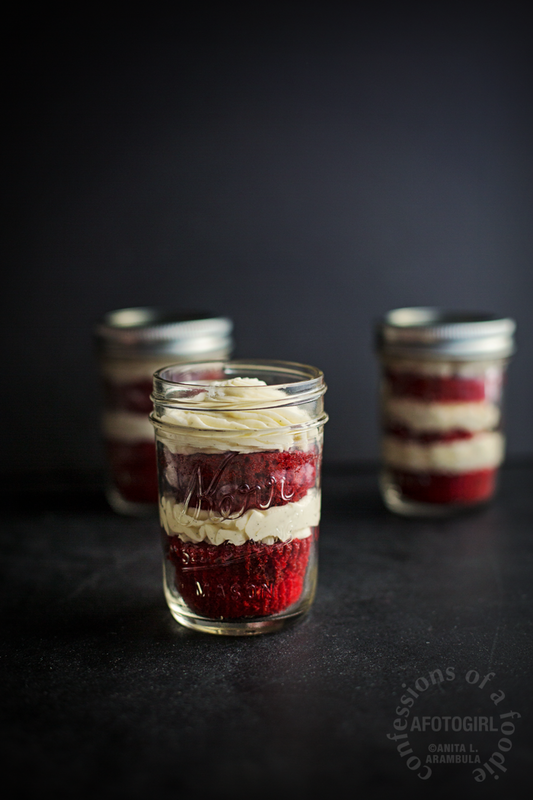 The cupcake jars can be left out overnight in a cool spot or stored in the refrigerator for up to five days. *Note: if you use salted butter, omit the salt listed in the recipe. These look so yummy! I wonder, sis, could there be a carrot cake with cream cheese frosting in a jar experiment on the horizon? hint hint! @Ani - OH MY GOODNESS! That would be wonderful, sis! What a truly awesome honor it would be. We haven't cooked together in forever. Just let me know when you would like to do it and I'm on board!